Picture a condominium complex atop 1.4 hectares of prime property, approximately 70 percent of which is occupied by resort-like open-air leisure amenities, including three swimming pools, a jogging path, a pavillion, parks and gardens, a picnic grove, and more. Now at Flair Towers, imagine that aside from the outdoor amenities, you can unwind at a fitness gym, spa, game room, or music room. Or bask in the luxury of a sky-high roof deck “the Observatory”, where a plaza park, a sky lounge, a jacuzzi and view decks beckon. Finally, imagine entering your unit, and being treated to a generous inflow of natural light and wind, made possible by the revolutionary Lumiventt design technology. 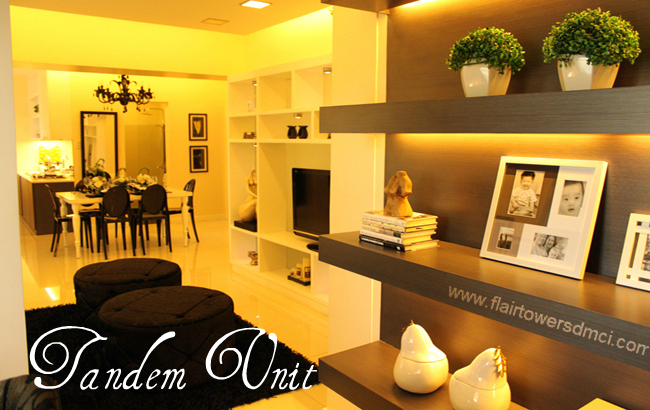 Flair Towers is nestled near the Central Business Districts of Makati, Taguig, and Ortigas. You would call it amazing, we call it Flair Towers. And it’s guaranteed to broaden your view of condominium living.